We take for granted that four out of five dentists agree when it comes to best toothpastes or superior toothbrushes (and that the fifth dentist is just asleep at the wheel, or something), but how much do we really know about what those recommendations are grounded upon? As it turns out, not much. That’s mostly because it’s actually really hard to test the effectiveness of our dental hygiene tools. 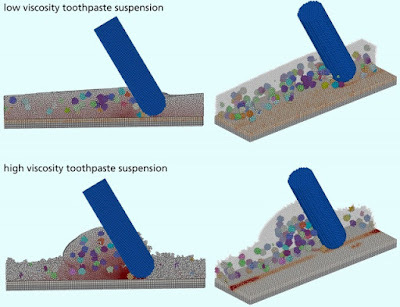 But now, researchers at the Fraunhofer Institute for Mechanics of Materials IWM in Freiburg, Germany have developed a virtual brushing simulator which may change how we look at our toothbrushes, and may help doctors really test out the effectiveness of our brushing tools. For the first time, researchers will have an efficient way to determine how shape, stiffness, abrasiveness, and even toothpaste viscosity affect our teeth’s enamel, and more importantly, the germs sitting atop our teeth. “We can increase the scope of the experiments far beyond what is possible in real-world testing, and that makes a noticeable difference in the quality of the products,” the Institute claims. So if you’re looking for a way to test your toothbrush (or want researchers to just do a better job of it), thank the folks at the Fraunhofer Institute and their fancy toothbrush simulator.